2017 Ben Rhodes #27 Safelite AutoGlass / Toyota Tundra NASCAR Truck diecast, by Action. 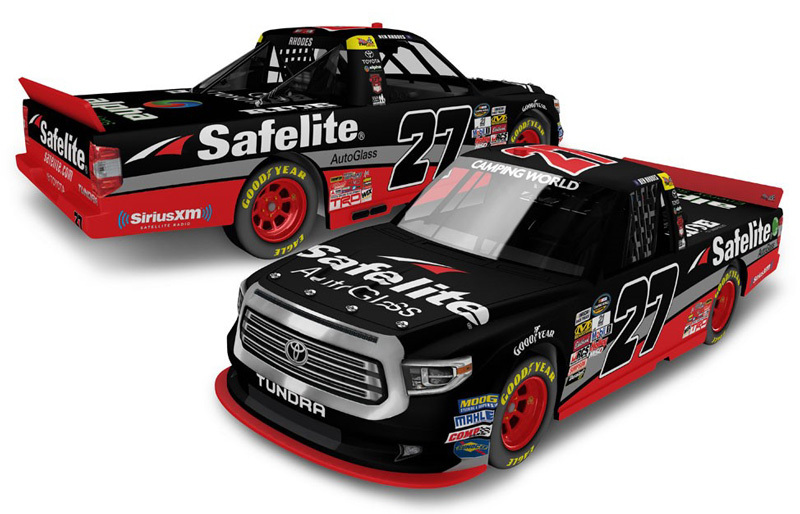 This ThorSport Racing #27 Safelite AutoGlass Toyota Tundra truck was raced by Ben Rhodes during the 2017 NASCAR Camping World Truck Series season. This diecast truck is produced on an all-new Toyota Tundra tooling. These are Hard Top (HT) the hood will not open. Action Gold Series HT trucks feature a hardtop diecast body with plastic chassis. This car is packaged the same as the Platinum Series and includes a silver sticker with "1 of XXXX" indicating production run and DIN (Diecast Identification Number) for registration.